1. This is how you feel every time you get on the freeway. 2. 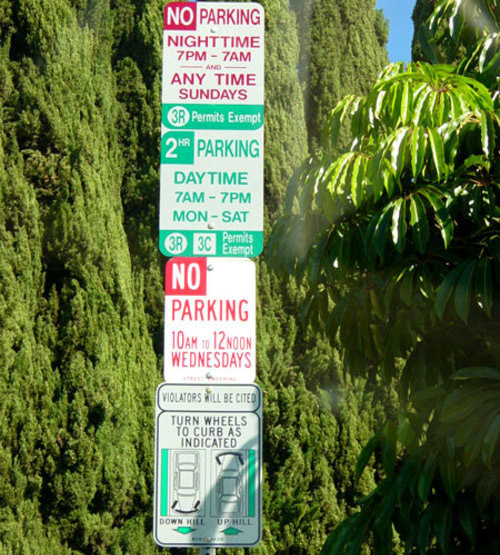 You've spent countless minutes trying to sort out what the parking signs actually mean. 3. Seriously, ain't nobody got time for these parking riddles! 4. This is your BFF. Thank you, Sigalert, for always telling me when it's OK to leave the house. 5. 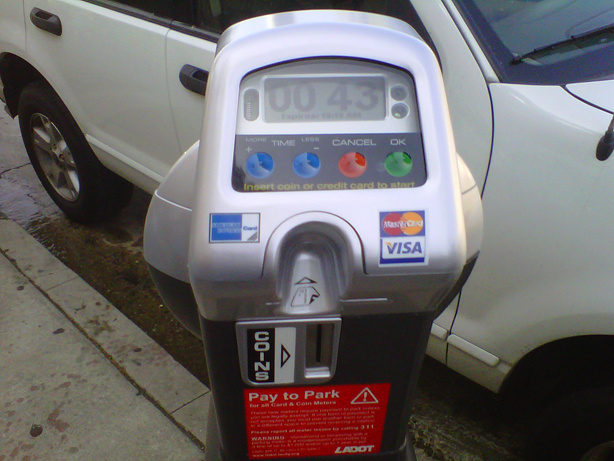 If you pull up to a meter that still has time on it, it feels like you've just won the lottery, but better. 6. Red-light cameras are terrifying, because no one knows if you have to actually pay the fine. 7. And you don't want a ticket, because when this happens, it's as if the whole world is plotting against your happiness. 8. Seeing this on the highway is not strange. 10. You've gone through all of the stages of grief when it comes to L.A. traffic: Denial, Anger, Bargaining, Depression, and Acceptance. Though I'm still stuck in the "despair" stage of things. 11. The California DMV is a black hole from which no one ever really escapes. I'm pretty sure I died the day I got my driver's license. 13. Switching stations to KPCC when KCRW is on a pledge drive. 14. You've said this before, and genuinely meant it. 15. You remember the fear of Carmageddon all too well. 16. This is a very important question you'll never know the answer to. 17. Refusing to go to Santa Monica because it's too far of a drive is a valid excuse. 18. The devil's bargain: Do you take the freeway, or the canyon road (Laurel, Coldwater, Sepulveda)? 19. You have a love/hate relationship with valet. You love that they're usually everywhere, just like Cher says. But you hate that they needlessly take up parking meters with their annoying orange cones. 20. The person who did this parking job is a horrible human being. 21. And the person who drives this red car should be arrested. How you gonna park like that, Ford?! 22. 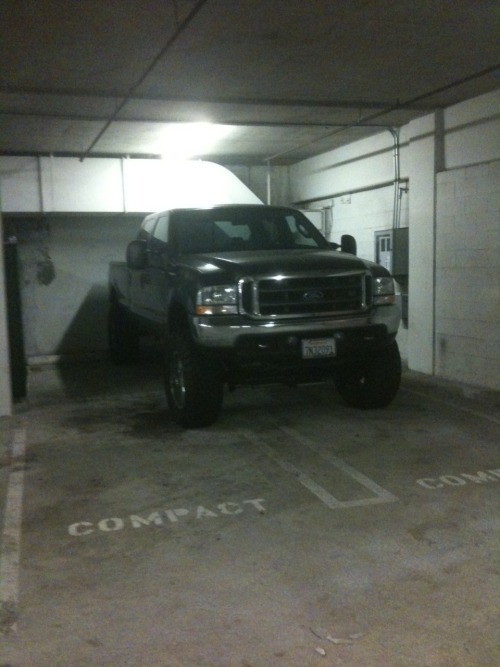 When you're desperate to find parking, you fully believe you can squeeze into any space, even if you clearly can't. 23. That amazing feeling when your side-street shortcut is wide open, and you pass all the suckers on the highway. 24. This sign means you have to make an important decision of whether to brave the garage, or just give up on life and go home. 25. When someone wastes precious parking inches, you get irrationally angry. 26. You've seen hell, and it's the parking structure at Hollywood and Highland. 27. But you keep on driving, because you know how good it feels to blast your favorite song in the car. 28. Sometimes it even makes you appreciate the music more. 29. And someday you might get a parking spot with your name on it, which means it was all worth it. 30. Or, ya know, the apocalypse could happen, and then you won't have to worry about traffic ever again! Angelenos will inherit the earth!